A lot of people do not understand what a back proxy is let alone why they need their own residential back connect proxy. Before you can even look at the different proxies out there you need to understand the basics, that is, know what a proxy is and what it can do for you. A proxy is defined as computer that relays a network user’s request across the internet without connecting the user’s computer with another across the World Wide Web. It is essentially a gate protecting your IP address. What the proxy does is to strip identifying data and fills it with its own. It relays what you searched for and the web server. The web server will only get altered data about you. The results of your search pass through the same proxy server back to you. The proxy being the gate keeper keeps you anonymous and safe. They removal all referral data so that the other servers receives absolutely no information about who you are. They can distort data by removing some parts of data so that the web server gets incomplete and misleading information. They can be transparent and not hide information about you. They aren’t usually used for information but for pure data. A standard proxy server can be configured to be public, accessible to anyone or it can be private and restricted to a select group of people who may be required to pay for access. Proxy servers can pass altered or unaltered data, have ads added or not. They can located virtually anywhere in the world from the U.S to Africa or they can be located in your basement. They are important for security reasons but one proxy is not always the most secure way to protect your internet activity from prying eyes especially by someone who has the skill to pry and the motivation to do so. If you want serious protection from you might want to try Backconnect proxies. These are more secure and ideal if you have big data to scrape through. A casual internet user might be taking security a tad too far unless they have something to hide about the internet activities. When you opt for a proxy, be prepared to deal with latency issues. The extra step that your information has to take by going through the middle gate will affect the speed at which you get information bouncing back. It will not matter how fast your computer is, or the protocol you are using, a proxy is still a step that will take an extra second or two. This is the biggest drawback for proxies. How Backconnect Proxies Differ from Regular Proxies. Backconnect proxies work like regular proxies. The difference is the configuration of the backconnect proxy itself. A backconnect server will give you a single IP address. When you use the server the server funnel your data through a network of machines with different configurations. This means instead of one gate keeper, your gate keeper will have 20 to 50,000 sentries swarming around it. So essentially a backconnect proxy is not a single machine but a network of machines releasing, scraping and fetching information using a myriad of IP addresses that might look like you are located in several parts of the world all at once. Complicated? It really shouldn’t be. Let us just illustrate what happens: If your type www.abc.com, you will get the first connection taking you to that site’s home page. If you type a search query on the search bar on that page, the connection is picked up by the second connection and it is relayed back to through a different connection once you click on what the third connection just returned that is communicated click is sent out by another connection, etc, etc. You could be browsing an clicking various things on a website and every time you request information, a backconnect changes connections, alters your data numerous times and can make it hard for anyone to backtrack and follow what you have been doing on the internet. Backconnect proxies allow you to pretend to be anywhere in the world and they support various protocols. The number one benefit is actually privacy and security. However, you may be working on a project that requires massive data scrapping. Google and other search engines tend to frown upon multiple requests originating from a single source and they may block or blacklist your IP address. Google will read it as action being done by a bot and not a human and create a Captcha or impose a rate limit. If you have a swarm of backconnect proxy networks not only will Google e unable to register activity coming from one IP address but different ones, spread across the globe. You will also get the information and data you need to get faster. 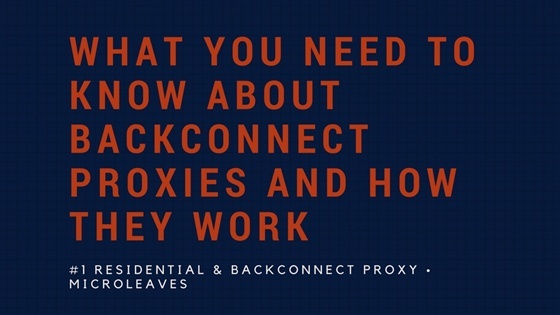 There are only a few companies that provide the best residential Backconnect proxies, one of the most popular ones is Microleaves. There are a lot of reasons why people opt for Microleaves’ proxies. They are widely spread than conventional proxies. They have more IP addresses than other proxies. They can handle all kind of internet traffic and support the use of software like Xrumer, GScraper, Scrapebox and others without affecting the rate. Backconnect Proxies get banned less often because they create a lot of back connect proxy residential IP addresses. They can be difficult to use if the user wants only IP addresses rom certain countries or regions. A lot of unscrupulous people have used Backconnect proxies in the wrong way. Unfortunately, we cannot change the world and remove the hacker element, nor can we dampen a curious mind trying to test the limits. It is only up to service providers to police their own networks and institute stricter measures to curb misuse. Despite the misuse, backconnect proxies are still the best way to ensure that you remain anonymous and that what you do online remains private.